Damon Pace is on a mission to help both retailers and individuals enhance affinity buying. It’s not Pace’s first start-up foray. In fact, he says he spent 20 years as an entrepreneur, mostly in real estate technology and internet marketing. When Pace decided to leave California, he says he looked at a number of cities including Austin, Boulder and Nashville. “I had heard about Chattanooga and liked what I saw,” he says. Once in the Gig City, Pace began developing a prototype for Buyer Squad. The test site for Buyer Squad was built around something Pace knows drives a number of individuals – sports. In this case, it was the opportunity to buy a Tennessee Titans football jersey. While 830 people signed-up, Pace says he could not deliver the product after failing to negotiate a deal with the official National Football League licensing company. “The product is built and officially launched,” he says, adding that the concept capitalizes on the loyalty of consumers, both to businesses in their community and to specific interests the individuals have regardless of city. So, how does it work? Pace has identified an initial set of 200 unique affinity opportunities – everything from local restaurants and retailers to fans of a particular sports team, owners of specific vehicles, shoppers at national chains, mothers, gamers like those using Xbox, and individuals of a particular political philosophy. “Individuals can select as many affinity groups as they want and receive notices of offers from them,” Pace says. 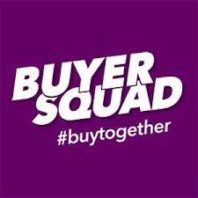 For retailers and others, Buyer Squad is a way to expand their market and influence. For individuals, there’s the benefit that comes for the power of group buying, something that addresses a personal passion of Pace – economic empowerment. The effort thus far has been self-funded.